‘this little village will not much longer be without a hotel and one that will not disgrace the beauty and pleasantness of its situation,’ bragged Joseph Howard when he bought this site in June 1846. As Miles Lewis astutely noted, its location at and facing the beachfront rather than Fitzroy Street indicated its resort, rather than commercial market. Under James Mooney from 1853, the Royal was the centre of St Kilda. A prominent three-storied Mannerist addition, turning the corner of Robe Street, next to the stables, was added in 1862. A beautiful hotel gas-lamp graced the corner pavement. Mooney died in 1869, but his family operated the Royal Hotel for the rest of the nineteenth century. They offered dancing, minstrels and singing. George Watson’s holiday-makers and longer-term guests co-existed together. It was the most popular mid-nineteenth century hotel in St Kilda. And it had established the ingredients of future successful hotels in St Kilda: accommodation for holiday-makers and longer-term guests, slightly raffish style, plenty of drinking and diverse entertainment. By 1929 it had been entirely swept away to make way for the construction of the Belvedere flats, in a style direct from Westwood, Los Angeles. The architect was William H. Merritt. He is said to have designed ‘numerous flats in St Kilda and Elwood’. Of these, five have been identified: Sur-la-Mer, 25 The Esplanade in a vaguely Old English manner, Valma at 17 Victoria Street, St Kilda (both 1936) and Lockerbie Court (cnr Orrong Road), St Kilda East (1938) and San Diego, 9A Princes Street (late 1930s) all in a bold plain Moderne style and the Modernist façade of 367-368 Beaconsfield Parade (1941). Beyond St Kilda, other Merritt flats are in Wellington Parade (cnr Garden Avenue), East Melbourne (1938), 263 Orrong Road, East St Kilda (extent? ), and Toorak Road, Toorak (1929). The building permit for Belvedere was issued on 18 December 1928. The builders were the well- known firm, J.R & E. Secull, still active today (as E. Secull). The developer was McAlpin Bros.
Belvedere is a three-storied block of thirteen flats. Nine of them have two bedrooms; four only have one bedroom. Those facing The Esplanade have a dining room separate from the living room. This is octagonal, under the belvedere, which is such a landmark. At the entrance is a cantilevered canopy, another American touch. Over the entrance is a cantilevered Juliet balcony, ‘supported’ on elaborate wrought iron brackets. There are also wrought iron window grilles. Belvedere is a St Kilda landmark and reflects similar domical elements on the Sea Baths, Palais Theatre and at Luna Park. It is clad with Cordoba tiles with splendidly decorative curlicue wrought iron brackets and bellied wrought iron balustrades. Parapets are capped with Cordoba tiles and decorative rafters project from walls. All of these are characteristics of the Spanish Mission style. The design is similar to apartment blocks being built in the 1920s on the West Coast of the United States, but also in New York, such as Del Mar Towers, Brooklyn (1926). Bathrooms at Belvederare theatrically extravagant, with barley sugar collonettes supporting the over-bath cupboard, sea-green ceramic wall-tiles and even a sunken bath - a Hollywood dream come true. Belvedere marks the arrival in St Kilda of the extravagant domestic exotic in flat design. Preceding it chronologically are Summerland Mansions, (1920, 15), in a restrained Classical, English Arts-and-Crafts and Mediterranean manner. Kings Grove, at 44 Fitzroy Street, is also well-mannered stripped Classical. The earliest Spanish Mission flats in Melbourne, Aston Court, 43 Acland Street, St Kilda (1919) by architects Edwin J. and C.L. Ruck, subsumes a Victorian house with a very house-trained design; although there are earlier Spanish Mission maisonettes from 1925, by Marcus Martin in Domain Road (cnr Caroline Street), South Yarra. After Belvedere, comes Baymor (1930) at 6 Victoria Street, which developed the Spanish Mission manner further in a more domestic way, set about a private cortile space. The architects there were Sydney Smith, Ogg and Serpell. The Spanish Mission domestic style developed in California over 1891-1915, following the restoration of the Franciscan missions and the founding of the historic preservation movement with the California Landmarks Club in 1894. The icon ode to the Mission style was the Californian building at the 1893 World Exposition at Chicago. The style quickly caught on, particularly in Hollywood and Westwood and in the homes of the stars. In 1920s California there was a separate craze for Moorish details in the Spanish Colonial Revival, not so noticeable in Australia. Here, Spanish Mission means textured light coloured render parapets, and Cordoba tiles, Baroque decorative details and forms, arcades, with barley-sugar columns, wrought iron grilles, balustrades and lamps with curlicues and adobe references, such as projecting joists. Towers had previously been incorporated into design of the Canterbury (21) and I.G.Anderson’s Avenue Court in Albert Park, to take advantage of bay views and as a formal compositional element, marking the corner. Another corner tower is at Bradoc House, Victoria Parade, East Melbourne where it was floodlit at night. Other architects to use corner towers in the 1930s to mark the staircase included Gawler and Drummond, Stuart Hill and A.W. Plaisted. Robert Hamilton’s Kings Lynn in Toorak is very handsome. In Australia, there are some architect-designed Spanish Mission houses before the Great War, but the trend did not catch until the mid 1920s. The greatest Australian example is the house Boomerang in Elizabeth Bay, Sydney by Neville Hampson (1926), for music publisher, Frank Albert, now the most expensive house in Australia. In Melbourne, large Spanish Mission houses by architects Leighton Irwin and Marcus Martin were publicised. By the late 1920s there were many examples of the style, from the restrained Querida, 48 Victoria Street, Sandringham (Irwin and Stephenson, 1926) to the exuberant Kellow Faulkner Motors (Harry Norris1928-29), now the Royce Hotel, St Kilda Road, Melbourne. It is said that Kylie Minogue, a performer, may have purchased (in November 2000) a flat in Belvedere. The roof garden of 22A, next door to the south, has been made televisually famous around the globe as the set for the ‘soap’, The Secret Life of Us. 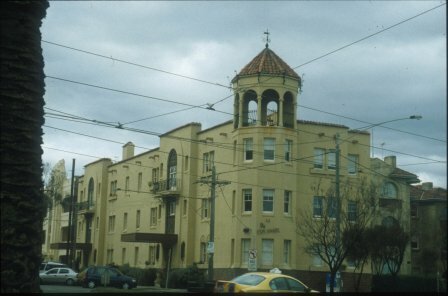 Other St Kilda buildings prominent in the series include the Vineyard Restaurant, 71a Acland Street and the interiors of Inverleith apartments, corner Eildon Road and Church Square, St Kilda. My friends in Norway refuse to miss an episode, helpfully subtitled in Norwegian, so familiar are they now with the street life of St Kilda, Australia. Bick, David & Wilson Sayer Core Pty.Ltd. St Kilda Conservation Study. Area 2. (Undated ). p165. Gebhard, David & Winter, Robert. Los Angeles. An Architectural Guide. Gibbs-Smith. Layton 1994. p xvii. Goad, Phillip. Melbourne Architecture.Watermark Press. Sydney 1999. pp 109 and 116. Goad gives Aston Court’s date as 1919: the Heritage Study states 1926. Heritage Victoria. Victorian Heritage Register No: H812. Kearney, James, Melbourne and its Suburbs, 1855. National Trust of Australia ( Victoria ). File No: 6117. Sawyer, Terry. Residential Flats in Melbourne,1982. p92 & figs 107 & 108. The Argus. 9 June 1846. ‘The Observer’. ‘Two To Let And One to Live In’. The Australian Home Beautiful. June 1, 1938. p29. The Royal Hotel, c1853 engraving. (Held, Port Phillip City Collection). 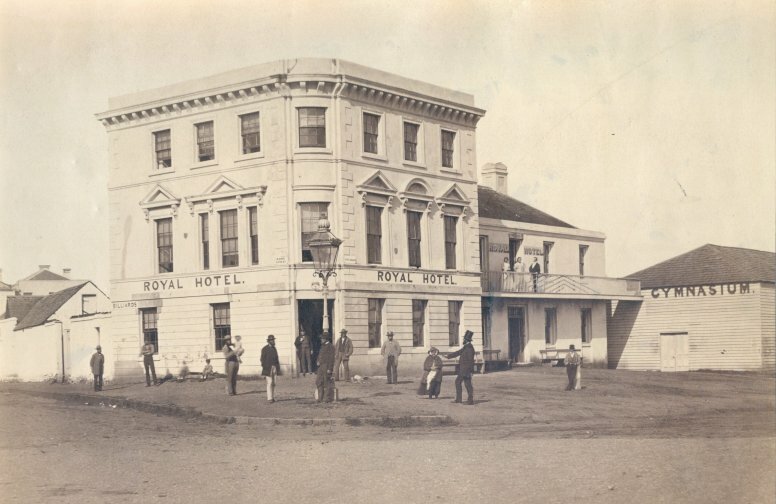 The Royal Hotel, photograph, 1862. (Held, Port Phillip Collection). Upton, Gillian. The George. St Kilda Life and Times. Venus Bay Books. Richmond 2001. pp 21 & 22.